Does your company struggle to create frequent, relevant content for your social media posts, website articles or newsletter? There's no sense in spending time creating something that won't be watched or writing something that won't be read. Here's a few of my favorite techniques for generating topics for posts that will boost your follower's interest in your company and prove useful to them as a customer. Tap into search engine data for topic suggestions... No experience needed! Try this: type a word or phrase related to your business, followed by the words "how to". If search suggestions are enabled in your search engine preferences you'll see phrases that are great fodder for ideas that you can write about, which relate to what your customers (community, employees, sales prospects, etc.) are asking for information about. Case in point: if you search for "eCards how to" then you'll likely see that the topics "How to Make and eCard" and "How to Send an eCard" are popular topics. (If you want even more related suggestions, follow one of those topics and the search page will often display other more specific search ideas.) At CorpNote, we receive quite a few visits from search inquiries like these, but our stats show that the people coming to our site aren't necessarily interested in a pay-for eCard sending service. It's more likely that they are interested in knowing the size requirements for eCards, how to send them via regular email and tips for creating a good image. By 'listening' to the masses, via keyword search information, we concluded that it would be beneficial for us to create some resources for the DIY community, based upon our experience in the eCard and digital marketing field. We're all about helping people grow their companies, whether they are a CorpNote member or not. To this end, we've created a comprehensive resource, "How to Make and eCard - Birthday eCards, Anniversary Cards and More," which covers the best practices for creating, composing and sending your own eCards. The next time you are looking for ideas to write about, take a look at your own industry's keyword suggestions. Remember that what you THINK people are interested in may not be what they are actually asking for – and search engine suggestions are a great place to find out! Do you or your company have a website? If you said 'yes' then most likely you have a Contact Us link that sends an email or submits a form. These submissions may hold a treasure trove of excellent subjects for articles, social posts or direct marketing campaigns. If your responsibilities include managing customer satisfaction, public relations or employee morale, then chances are that you receive some electronic feedback already. But as a social media or newsletter content creator you might not. By getting on the distribution list of your company's internal or outside Contact Us submissions, you can stay aware of your company's most relevant 'hot topics' and generate more meaningful, timely electronic content. 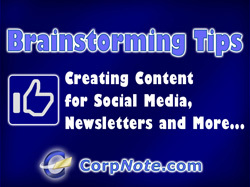 It's great to have an agenda or outline of topics for your upcoming electronic media campaigns. But don't let yourself get so busy sticking to your agenda that you neglect listening to your audience. If you are in a position to see people face-to-face, like at trade shows, networking events or business gatherings, then ask them what topics are top-of-mind. Even phone calls can be a great source of feedback and ideas bysimply asking people if there was anything else they were looking for but couldn't find. Online surveys have become the gold standard for following up on all types of customer interactions. Surveys can be used any time – throughout the year – to generate ideas and to sample peoples' interest. Once you've brainstormed your ideas, try vetting them in an online survey. Ask people to pick their top 3 topics of interest on a variety of subjects related to what you do. Always give them the ability to 'fill in' any additional comments or topics that they might have. Once you get people talking you'd be surprised at what they are actually thinking, compared with what you thought they wanted to hear. Remember that an online survey is also a great way to let your audience know that their opinion matters, give them an idea of how you are trying to better serve their needs, and give them a preview of topics that will make them want to follow your social media, newsletter or website posts in the future.